Note : this tutorial was originally written for ZBrush 3.1 but the technique is still applicable to the latest ZBrush version. In this short breakdown I will show you how I did the clothes on my “For the King” project. I think the first and most important step is that you start to familiarize yourself with the object you are trying to model and its behavior. I used flickr.com and google for my research and searched everything related to fabric and cloth. It helps also to search for other artists work to learn how they handle the subject. Drawings and sculptures show an already “compressed state” of an object. The artist has left everything out that’s not relevant and reduced it down to the important features that are necessary to make the viewer believe that he is looking at drapery. After I had collected a folder full of images I made a few quick sketches for a better understanding of folds and wrinkles. The brush-moves you are making in the 3d space of ZBrush are quite similar to the ones you are drawing on paper. The understanding how folded parts of the fabric expand and overlay in space of course is different. I aimed to make some really thin and slightly translucent fabric. It’s crazy how some of the great masters where able to create the impression of an underlying body, although you are looking at adamant stone. That is definitely much harder then recreating the same look with a combination of 3ds max and ZBrush with a complete body as a basis. For the cloth basemesh I have exported a midres version of the character mesh out of Zbrush and brought it into 3ds max. I’m using the Polyboost tools for all kind of polygon modeling in max. 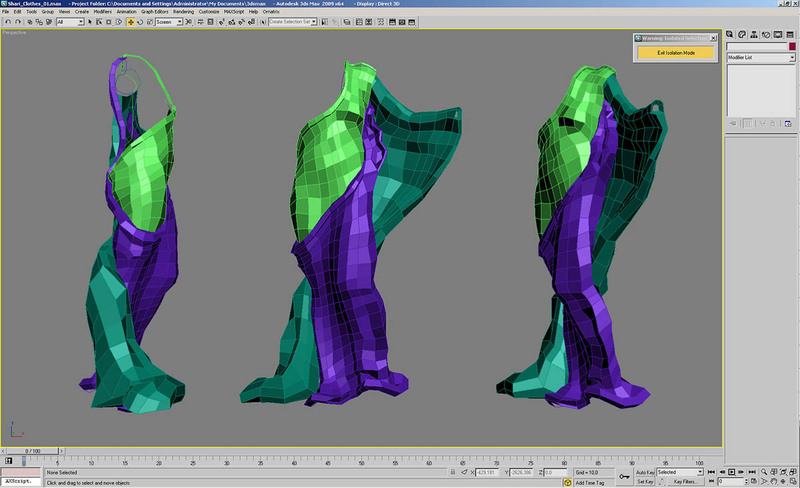 The polydraw subtool is great for this kind of work or for retopologizing a whole character. With the imported midres mesh as a basis, it takes only a few minutes to model the first part of the robe. 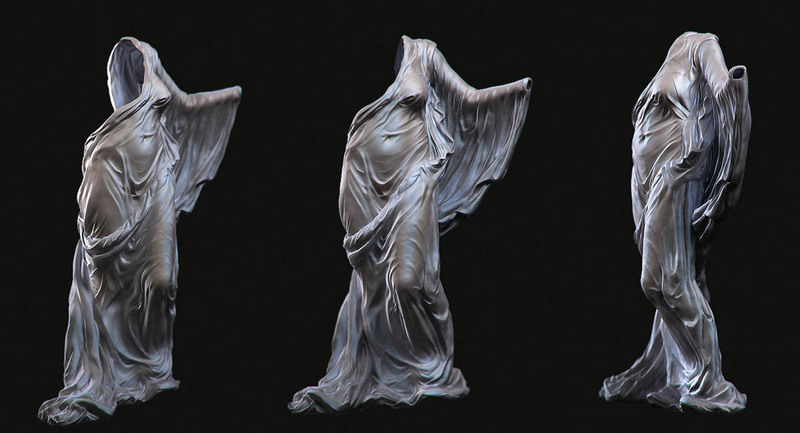 I have planned to split it in 3 pieces, so I can work with them separately later in Zbrush. As you can see on the screenshot below, it’s nothing more than simple polymodeling. Just try to keep the polygons as quadrangular as possible for a smooth subdivision in your sculpting package. After I was done with the mesh, I have exported every piece as an OBJ and attached it as subtools to my main character mesh in ZBrush. Because I was going to do all the fine wrinkles and folds on the highest subdiv level, I subdivided the piece already at the beginning. I pushed out some intersecting areas with the clay brush (you can use the move brush, too). Then I stepped up on a midres level and began to project some of the character mesh details onto my cloth mesh. I have done that with the projection brush. Make sure that ZSUB is activated and the brush intensity is quite low. Try to work only on surfaces that are perpendicular to your viewport (everything else will cause strange mesh distortions). After preparing everything for further sculpting I switched to the highest subdivision level and start working with my tweaked standard brushes. Basically I have just change the gravity strength options, brush mode and the alpha. Copy them in the ZStartup/BrushPresets folder in your ZBrush directory and they should appear in your brush palette after restarting the program. For smooth transitions between the strokes I used a standard clay brush. I was more or less “free styling” when creating the folds. I have used polypaint and gave these areas another color as the rest of the mesh. Finally I have exported the highres meshes and made a quick rendering in max. That’s all!